Held on the third Thursday of every month (exceptions occur) from 5:30 - 7pm our Business After Hours is an informal networking session held at a different member's location each time. Finger food, wine and beer are served as attendees walk around and interact and enjoy and evening with friends and colleagues. Click here to see our upcoming events and to register. 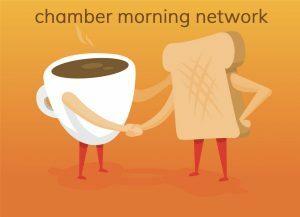 Held the second Tuesday of every month (exceptions may occur) from 7 - 9am our Chamber Morning Network is a formal networking session with full breakfast and informative speaker. The event is located at the Westport Inn. Cost is: $20 per member, $25 non members, 3 Pack available to members $54.